I first became interested in creative ironwork after becoming a welder in 1978. A blacksmithing course in the early 1980's opened up new possibilities for creative work by adding the forge to welding and cutting iron. 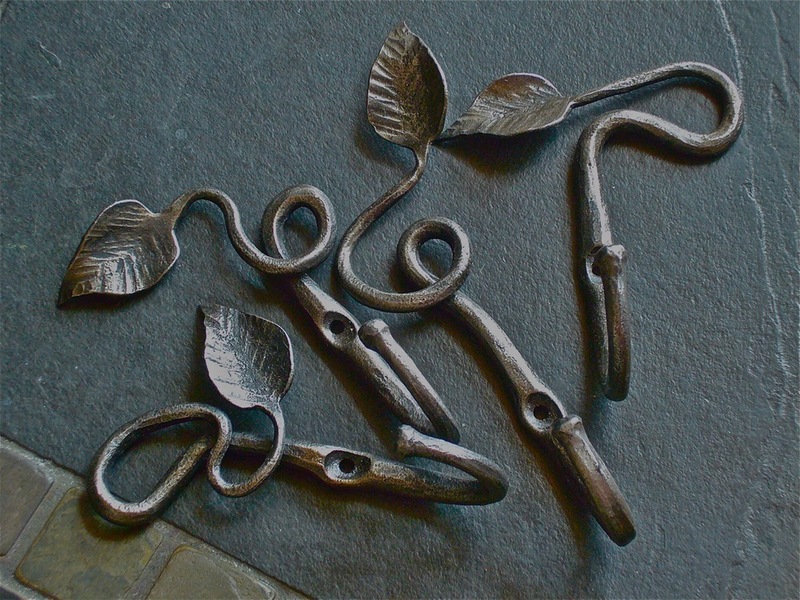 Blacksmithing can transform iron from its raw state into a beautiful work - a very gratifying experience. I am inspired by organic forms that are found in the natural world. Art gives meaning to our lives, and while I enjoy producing traditional forms of ironwork, my greatest reward comes from creating my own abstract and functional designs. Alexander's door knockers are entirely handmade from weather-proofed pine and birch. Individually made by artist Terry Borsman. There are no rules! The final look and shape of my pieces come from the wood as much as from me. The piece is transformed from a living forest tree to unique, warm, friendly functional household furniture. 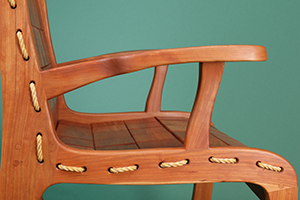 “Unlocking the beauty of Native Hardwoods". With a four generation Heritage of woodworking at Rockledge Farm, Scott Duffy and son Ian have now been making wooden wares and furniture here since the early 1980’s. On a 200 year old “hill farm” near the family’s original 1700’s settlement, they craft a wonderful selection of furniture and gifts in the finest hardwoods and burls native to this area, using converted barns for workshops and Gallery, From Salad Bowls turned from solid blocks of beautifully grained Cherry, unique Cutting/Serving Boards crafted from single planks or Figured Hardwoods, Carriers with intricately figured Birdseye Maple, Food Serving Utensils carved in Cherry Heartwood, to stunning One-of-a-kind Fine Furniture, they use woods which have been harvested in a responsible, sustainable manner. Their functional designs are carefully fashioned using time-proven methods, producing items that will be enjoyed and used for generations. I have been turning since my retirement from TWA 20 years ago strictly as a hobby. I turn pieces of wood that any self-respecting wood turner would throw in the fireplace. Leaving as much of the natural aspect of the wood showing has become, more or less, a signature of my practice. 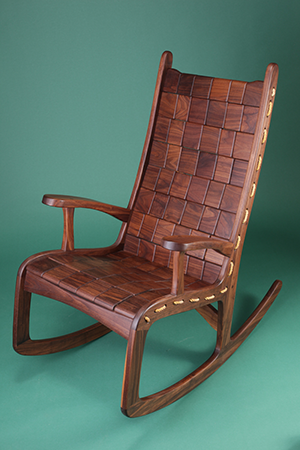 The Vermont Folk Rocker was designed in 1974 by Jim Geier. Shaker inspired, the chair developed out of a desire for a simple classic aesthetic. The design has been well tested throughout the years, resulting in a handcrafted rocking chair with a rich wood texture of the highest quality, intended to last for generations. The Vermont Folk Rocker is constructed out of solid hardwood in the choice of Cherry, Red Oak, Bird’s Eye Maple or Black Walnut. The chair’s seat and back are made of wooden blocks that are strung through the frame with 5/16 nylon rope. These blocks adjust for you as you sit, feeling more like an upholstered seat than solid wood. We offer two sizes, the Regular and Tall/Wide. Born in Rhode Island and growing up in Connecticut, Phil Morgan, is a 14th generation Yankee. Since age 13 he’s had a knife in his pocket and at any chance would whittle or carve. 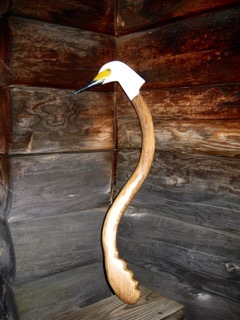 After college, while working for the National Park Service in California, Phil began specializing in realistic bird sculptures. Returning to his New England roots, Phil and his wife Lynn settled in Athens, Vermont in 1980 to build their cabin and raise a family. While his full bodied, life sized carvings were popular, the blocks of time they called for were hard to find after his kids arrived. He started searching for a product he could produce that would satisfy his urge to carve birds. 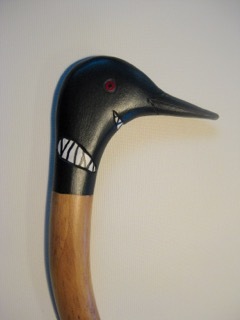 In 2001 he began producing his “FEATHERED FRIENDS BACKSCRATCHERS”. These backscratchers have become today’s Folk Art, as they not only serve a purpose but are pleasing to the eye. Having reached retirement age Phil looks forward to more time for his craft and hopes to also return to creating full bodied sculptures as well as his backscratchers. 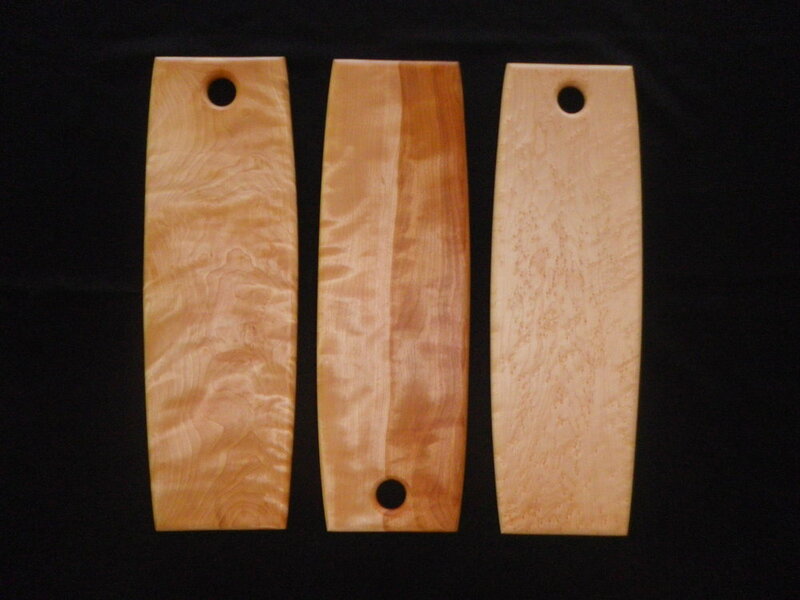 From Tree to Table... crafting artisan serving and cutting boards for discerning kitchens and spirited tables. I start with local hardwoods which have been sustainably harvested. I search the racks and bundles at a local family run sawmill that has been in business for over a century. I look for rough boards that have unique figured and grain patterns which help to produce one of a kind finished pieces. When designing and crafting the boards I adhere to the concepts of simplicity, function, and aesthetics and work with each one until there is nothing left to take away. The results are boards which have fine lines and calm and peaceful presences, yet boards which will provide many years of service with minimal care. 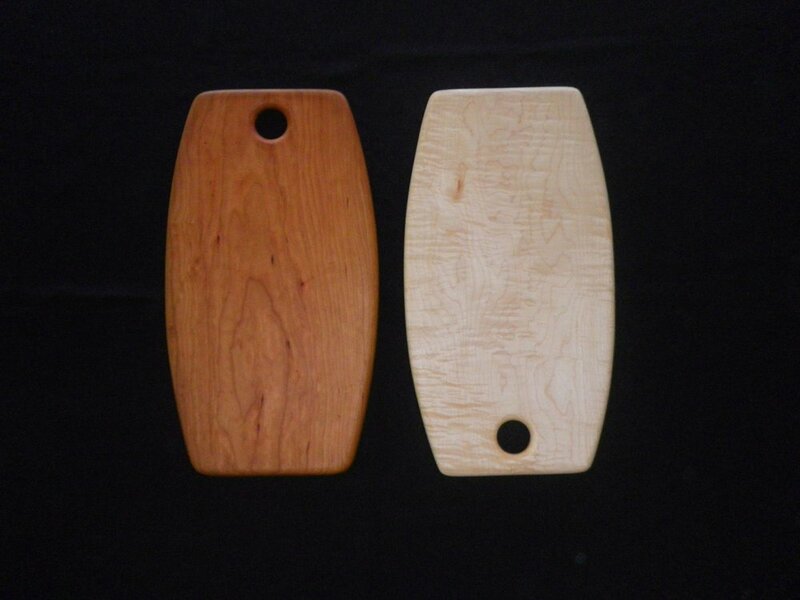 All boards are made from a single piece of solid stock which helps to assure that wood tones and figuring are consistent throughout the entire piece as well as being prone to wear slowly and evenly. Much time and attention to detail is giving to the finishing process which allows for each piece to be morphed into an art object that is both graceful and balanced. Several hand rubbed coats of mineral oil and beeswax are then applied to provide a food safe and silky smooth surface that offers protection, yet feels good to the touch. Each finished piece is intended to be both elegant and appealing. Not sure if Reed a native Vermonter as his family moved to this area in the 1750's when it was still part of New Hampshire but his work and life has revolved around this region. Starting as a fine artist who illustrated numerous Vermont Nature Books, Won 2 Vermont Waterfowl Stamp competitions, and his oil painting "Twin Maple farms" was selected by the Vermont Department of Agriculture to be "the image of Vermont Agriculture" in 2004. As life changes evolve in everyone's life painting is less of an option now but stopping an artist from their creativity is a lot like playing wack-a-mole. They just pop up creating something else. Reed's love for the story leads him to create from wood with history or that stimulates memories in the patron. Asked to sell his wood earrings and other products at a National Woman's Youth Hockey Tournament in South Burlington several years ago he had the creative nudge to make some from old wooden hockey sticks. He was so impressed with the patterns in the layers of glued wood that he started cutting up everything in sight. Tennis rackets, field hockey sticks, canoe paddles, golf clubs and more found his saw. Loving the story each triggered in his life he started looking for historical wood. Apple from Robert Frost's backyard, Posts removed from Shelburne Museum's Ticonderoga, quarter-sawed oak removed during the restoration of the very first house built at Shelburne farms found its way into his collection. 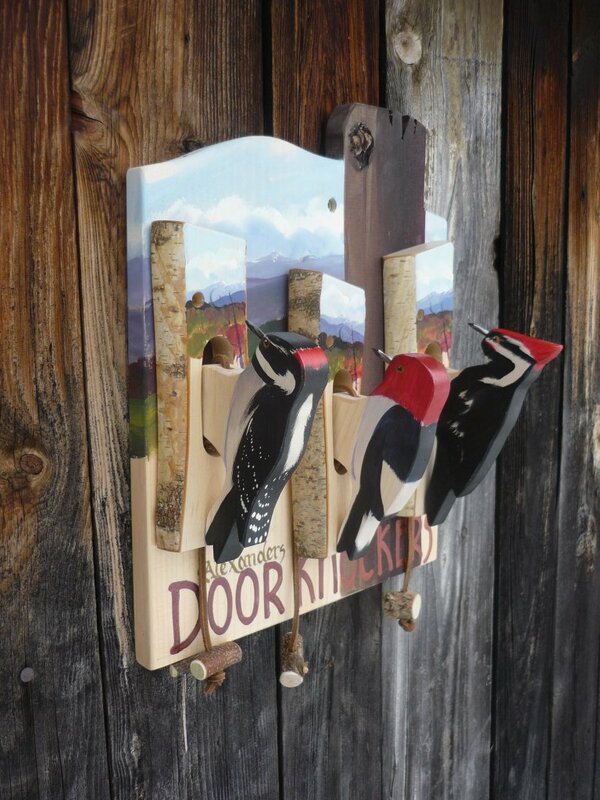 Now he runs Verde Mountain where "we create so that your story lives on" Making a variety of products from storied woods and loves taking wood from customers and custom-made products or gifts from their wood. Most pieces are displayed on nice cards with their story printed on the card. He lives in Lincoln Vermont with his wife and 2 grown sons nearby. David Scrase first turned a bowl in the 1950s. His first lathe was an old treadle sewing machine--there was no electricity in his family’s home in Upton, England. Unable at that tender age to do two things at the same time, he engaged his poor mother to treadle while he turned. In the 1990s he finally sprang for a cheap Delta lathe, which served him well for a few years. Then, in 1999, he bought a Oneway lathe, which was shipped to the Chebeague Island, Maine, where he has been turning ever since. Most of the wood David uses comes from Chebeague Island and Vermont. The wood is usually still green. When green wood ages, it sometimes becomes “spalted.” That is to say, the wood changes color and often takes on erratic lines delineating where the wood will begin to rot. Sometimes he chooses to leave the wood’s bark as the edge of a bowl. 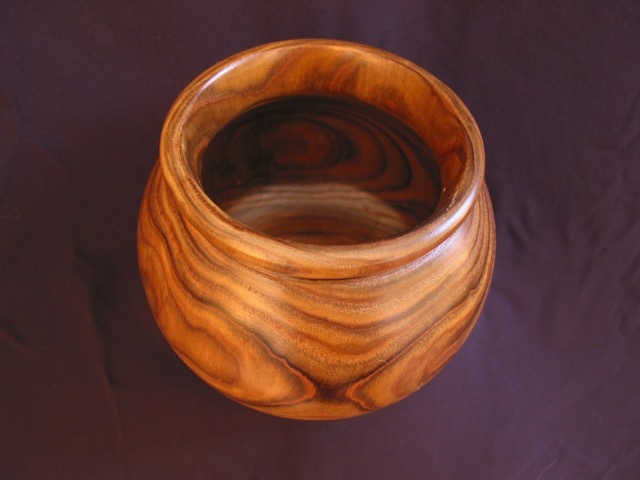 Such vessels are called “live-edge” or “natural edge” bowls. He likes to work with “defects, making a virtue out of necessity. He also loves to work with driftwood. I love old ramshackle wooden structures with their lean-tos and additions, especially barns with weathered gray siding and red trim. Rather than re-coloring anything, I prefer to work with the palette I find - so I always have an eye out for broken down farm buildings from which I can scavenge fragments. While living in the west, I fell in love with the raw beauty of the mountains and the desert. I was particularly drawn to unrestored ghost towns and the remnants of the mines they had grown up around where I found rusted metal with a reddish tone not seen in damper climates and deeply grained shards of wood which had hardened with age in the dry air. 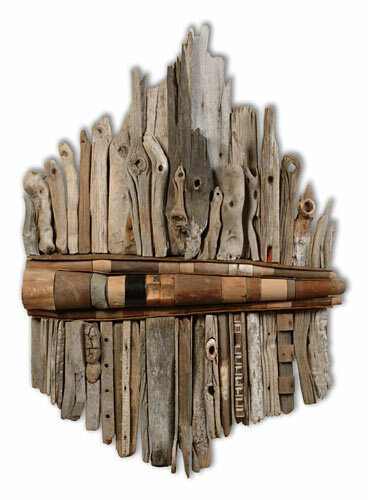 Driftwood is one of my favorite collectibles, especially painted pieces which have been tumbled to perfection. A recycler by nature, virtually everything I use in my art has had a previous life – bobbins, chair spindles, tool handles, toys, croquet sets and wooden patterns from steel mills-most of which is brought to me by packrat-types who enjoy seeing what I do with their treasures. Bits and pieces of things that are fun to look at are spread throughout my studio so I can see as many as possible at a glance. I constantly move them around making different combinations on my worktables until I’m satisfied with an assemblage. A visual version of perfect pitch seems to guide me as I tweak a piece to completion. I have loved wood since the first time I played with scraps of pine and a glue stick as a kid. Since those days I have studied philosophy and science, worked in a bicycle shop and as an assistant editor for a small magazine. I have fed calves, raised pigs and milked goats. I'm presently training my puppy, taking photos and writing about science and nature for my blog: The Nature of Things. (https://wordpress.com/read/feeds/67820166). Throughout, I have found time to work with wood. I have worked for carpenters and cabinetmakers, but since the early 2000's I've had my own business making custom boxes. I make bandsaw boxes, jewelry boxes, urns, photo boxes and Shaker boxes. I sell my work at galleries, online and through art/craft shows throughout New England. I create each of my pieces individually starting with rough lumber and ending with many coats of hand rubbed finish. 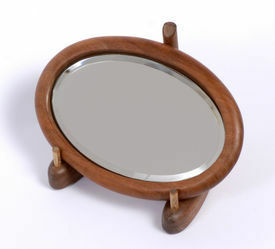 Finding new ways of bringing out wood's natural beauty still fills me with pleasure. 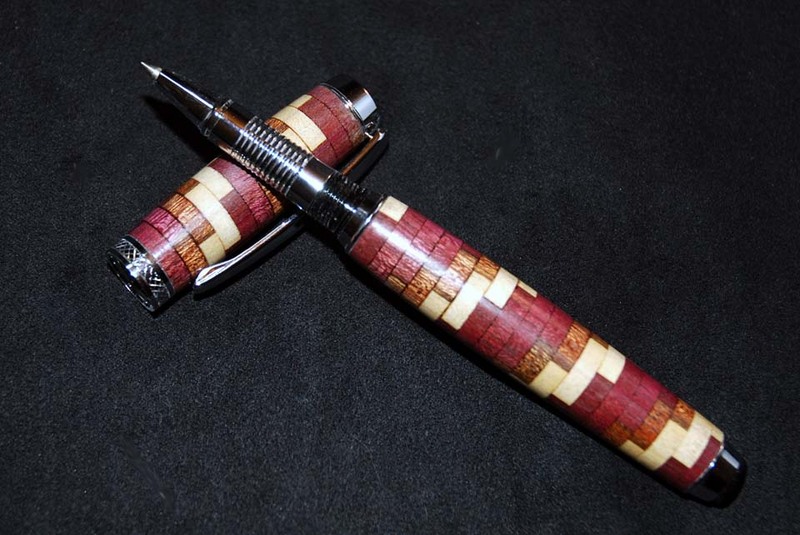 Gary Walz is a lifelong wood worker who has turned his attention to the art of crafting fine writing instruments for the past 10 years. Easily learned, but never mastered, pen making challenges him because of the endless possibilities of incorporating materials, colors and designs. In addition to woods Gary uses materials as diverse as acrylics, metals, pine cones, acorns, bottle caps, rice, sea shells and watch parts. Gary works out of his home studio in Milton, Vermont, and harvests the majority of his materials from his own property as well as from nature. For over 20 years, Peggy Potter has produced luminous hand painted wooden bowls. Often called "the perfect Vermont wedding gift". These bowls are considered heirlooms by many. In order to this preserve this art form, Peggy had been seeking the right person to carry it on. 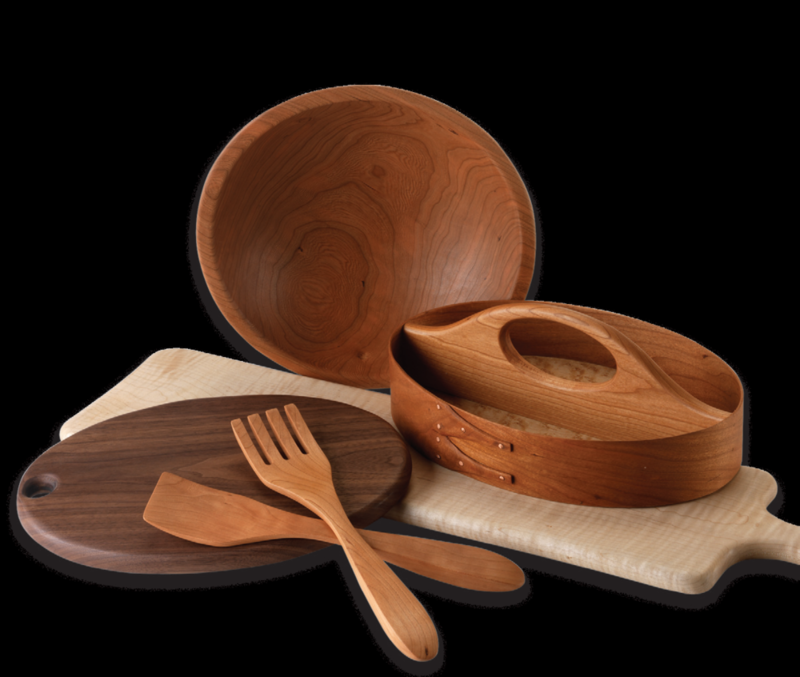 And so, in 2010 Lea Tyler returned to her home state of Vermont to take on the next generation of Peggy Potter Bowls, a company that hand finishes and decorates wooden salad bowls and serving utensils. Lea moved to Colorado and continued to create and sell these beautiful bowls. In 2016 Lea took on other interests and handed the reigns to Rebeca Wilson who renamed the business Cobalt and Curry. The bowls are turned from beech and cherry wood, hand painted and finished with 7 layers of a natural clear coat. The bowls are food safe and can be hand washed. The rolling hills, Green Mountains, and Lake Champlain lure artisans of all kinds to live in Vermont. Inspiration for art abounds here. 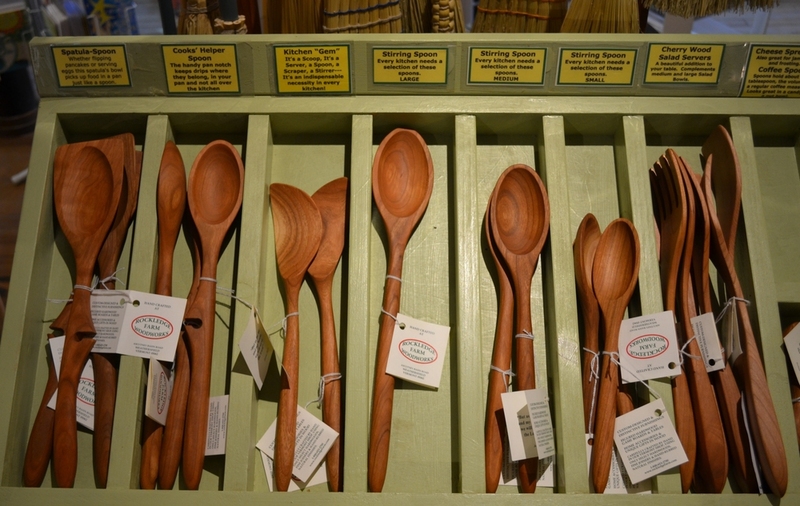 Although many artisans are transplants or “flatlanders” as Vermonters call them,Vermont Rolling Pins’ wood turner is a long time Vermonter. His family records date back to the late 1600’s; they were beckoned early on to this gorgeous state. When Vermont Rolling Pins’ wood turner turns a piece, he uses his heart, his mind, and his hands. Each piece gets his heart, even before he starts the lathe. He admires the solid wood’s unique grains and colors. When the lathe turns his mind remains focused; it stays intent on its subject. His hands work the wood to get the desired shape and then he sands the piece to a smooth finish and then each piece is oiled, enhancing each wood’s grain and color even more.